I would like to consider myself as an aware citizen of my country, but I must confess that having spent time with two campaigns on the 'Save Our Tigers' over the last two years with NDTV have demonstrated how little I knew about tigers and their conservation. The issues that exist, the complications that present themselves both with the big cat and those that work to save it. The environment, the poachers, boundaries, buffer zones, core areas, protection forces, government and legal compulsions, snare traps, sale of tiger body parts, China, smuggling across borders, tourism and its controls, re location of those that inhabit land within tiger domain and their needs, breeding, transferring the animal to other reserves, the restrained landed areas where excessive tigers can create problems of them moving beyond their stipulated boundaries and causing man-animal confrontations. Behavioral patterns of the big cat, its relationship with others of its kin, its cubs and their protection from their own parents who often kill them, marking their territory and protecting it from other tigers that may stray into theirs. A whole wealth of information and debates and promises from those stand on authority in different states of our land. The entire population of tigers in India is half of the entire population of tigers in the world and the importance of its protection therefore. How saving a tiger saves forests, environment, water and other animals that roam the jungles. And if they are saved then how mankind survives. And most importantly to make this generation of the youth and the young to understand the importance of the tigers existence, for, as many expressed, they would not like to introduce their grandchildren to the tiger through pictures only. Just so many interesting facets of this very important campaign and how it shall affect all of us in time. The contact made with specialists, their point of view and their dedication to the cause. The finer points that they educate us with. The support given by those in power and getting them to come up live on national television and listen in to our questions and to find them so conversant with the problems and matters concerning the big cat... just an entire day of non stop information, opinions and ideas of how we as a nation need to look after this most important pride of our country. Alongside all the activity of course was the drive to attract donations from viewers and those that are sympathetic to the cause. To be able to collect as much as we could in cash to be able to provide in a very small manner the essentials required by the guards that are equipped with an apology of weaponry against the more sophisticated arsenal of the rampant poachers that flourish and are a source of all that is destroying the lives of this beautiful animal. And... surprisingly the connect with those are involved in drug peddling and the supply of unlicensed arms. The sale of the parts of the dead tiger forms a ready market, particularly in China for medicinal purposes and the money accumulated by these poachers being used for drugs and arms. That after drugs and arms it is tiger body parts that is the largest smuggled commodity in the world. Alarming and so dangerous! 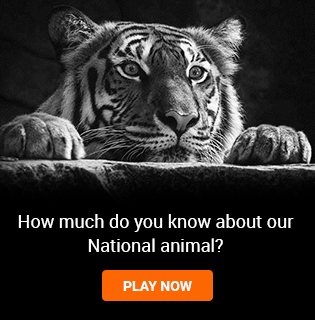 In all an entire day and night filled with the most informative facts on the tiger! Unforgettable, and so filled with emotion! And of course not to take anything away from the most dedicated and hard working men and women, mostly women, that conducted this exercise in almost military like proficiency, without any glitches, or if their were any, to have not allowed it to percolate beyond the control room!! When the women do take over the world, which is not an improbability in the not too distant future, I can assure you we shall be in safe hands! !